In four days, the third episode of the French TV show « Pékin Express » will be broadcasted on the French channel M6. Four days to prepare the tweetstorm that will sweep over the channel. As soon as last Wednesday afternoon, we and a certain number of Internet users mobilized to inform of the brutal and systematic ethnic cleansing that has been happening in Burma for more than two years, mainly against one ethnic group : The Rohingyas. Even if the junta, and nowadays the authorities have always oppressed the Burmese people and the minorities, whether they were Buddhist, Christian, Animist or Muslim, the particular persecutions undergone by the Rohingya minority are to be distinguished from the other ones because in this particular case the Rohingyas are to be completely wiped out. The Rohingyas cleansing is literally systematic. In other words, the Buddhist criminals that are exterminating them are acting following an ideology that promotes genocide as a system. A symbol of that is the nickname given to the vile Wirathu that many call “The Burmese Hitler”; nickname that owes nothing to chance. Just like Hitler that has implemented as a system the Jewish physical extermination from earth (the grim Final Solution), Wirathu has theorized the Rohingyas’ total cleansing. That makes one better understand the title of the article « Pogroms that we cannot ignore » published on the website The Jewish Chronicle Online whose author, David Aaronovitch, is Jewish himself. In four days we will mobilize again. This time we will anticipate better, indeed, last Wednesday the tweetstorm was improvised. Tonight, at 9 PM GMT, less than half an hour before the beginning of Pékin Express we uploaded a good practices guide to create a successful tweetstorm. We invite you all to read this guide which is freely available online by clicking on the following link : Tweetstorm against Pékin Express: guide for a successful mobilization on Twitter. On Twitter we are a bunch of motivated people that strive to support the voice of the oppressed in Burma. Join us! If you do not have a Twitter account, this is the perfect opportunity to create one. If you already have one please post as soon as today to inform people about the situation in Burma. Every user that will click on the hashtag #PekinExpress – and the number of users is huge as the show is streamed and can be watched later online – will probably learn that M6 has filmed its show while men, women and children were dying under the violence of the Buddhist extremists. Additional Information: The picture in the beginning of this article has been taken in 2013 during a humanitarian mission of the charity Barakacity. 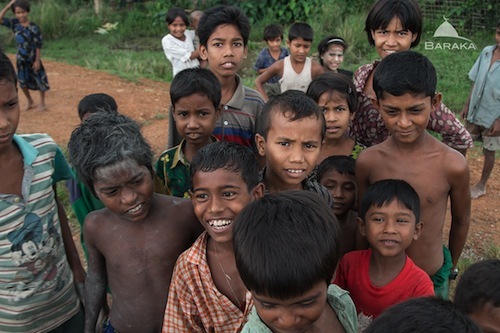 These are Rohingyas and other children that the Bouddhist extremists of Wirathu want to eliminate. Let’s tell this truth to the world. Let’s not be silent. Let’s mobilize.